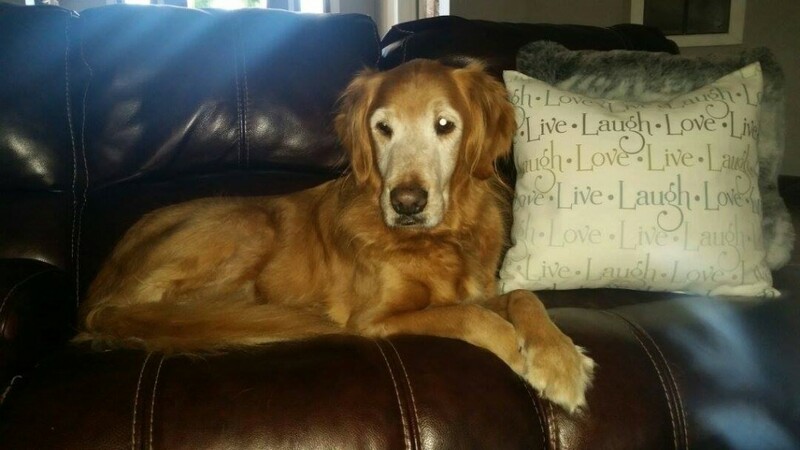 Marley … a 10+ year ECGRR success story! 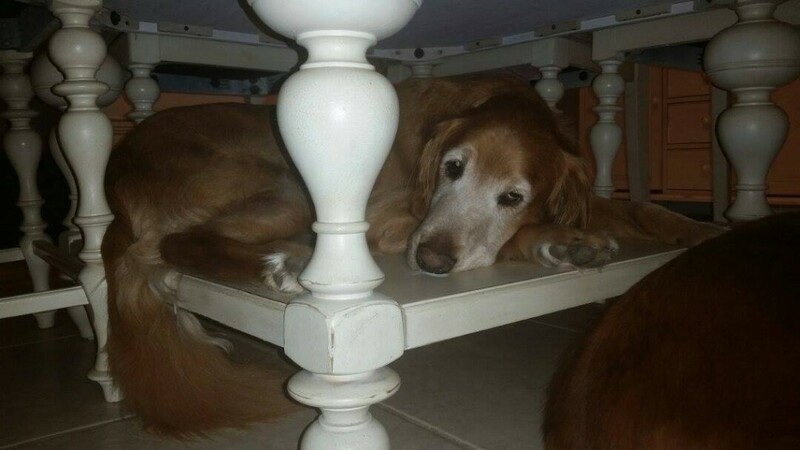 My name is Jeffrey … I live in Tampa and 10+ years ago I adopted a dog from ECGRR, Marley. Marley is amazing and still with me nearing 15 years of age now and is showing signs of old age. 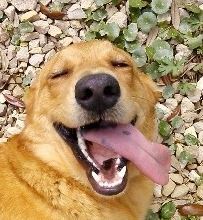 … Marley was a deep red Golden….now with ‘blond’ on his face. Here is a picture of my baby that I adopted from ECGRR long ago. 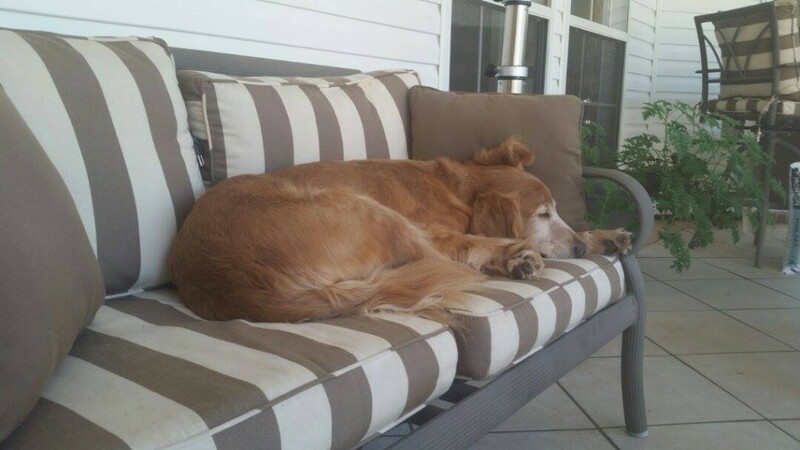 ECGRR: Marley seems to have a really rough life! Thanks for sharing Jeff! 7/24/2018 – over the next 72 hrs the ECGRR website will be offline at times while we upgrade to a new server. 03/13/2018 – We’ve recently updated the volunteer database and need your help in verifying your data is current. 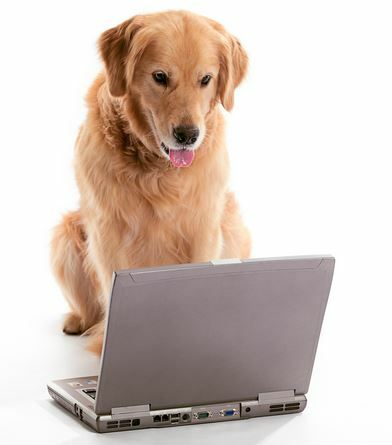 Asking that all volunteers login at the website and make sure contact information is current along with volunteer areas that you can help with. 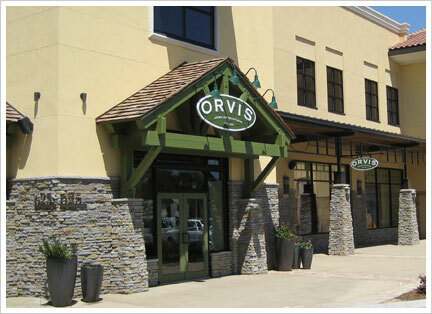 ECGRR will be at the Orvis We Love Dogs Event this Saturday and Sunday (March 10 and 11) at the Orvis store in Sandestin, FL from 11am to 1-2pm. 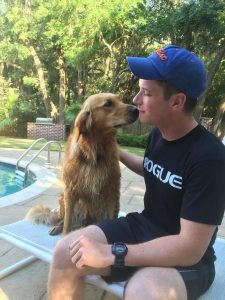 Orvis loves dogs and we love Orvis for all the great support they’ve provided to us over the years. Please stop by to say “HI” and meet some of our alumni. We’ll also have information about our rescue and how to adopt! Our website will be unavailable 10/15 (sometime in the PM) for some updates. This could be intermittent during the time-frame. We have a new mailing address and ask that you update your records and use this new address for all correspondence and any mailed in donations. Long time ECGRR volunteer and Board member Kandie Evanchyk, is taking a step back with rescue activities and has resigned from the Board of Directors (BOD). She, and her husband Randy, have decided to focus on adventures traveling in their recently purchased Airstream. Kandie had been the main manager for ECGRR operations, working as needed in just about every area of the rescue – intakes, fosters, adoptions, volunteers, etc. All of us wish her the very best! Shop Amazon and help ECGRR!! AmazonSmile is a simple and automatic way for you to support ECGRR every time you shop, at no cost to you. When you shop at smile.amazon.com, you’ll find the exact same low prices, vast selection and convenient shopping experience as Amazon.com, with the added bonus that Amazon will donate a portion of the purchase price to ECGRR. Calling all my fellow ECGRR Rescues! My name is Bella, I am a 3yr. 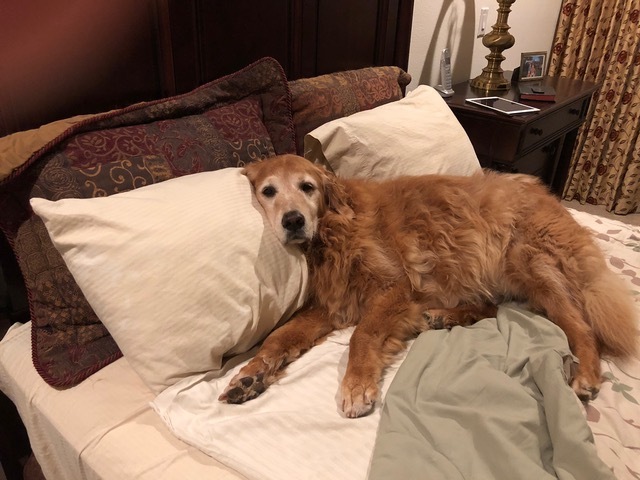 old Golden. 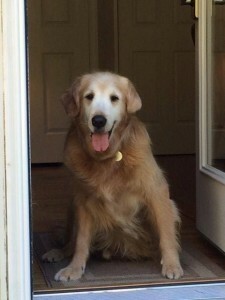 ECGRR placed me in my forever home August 2015. For that I am eternally grateful and have a desire to “give back” to others. 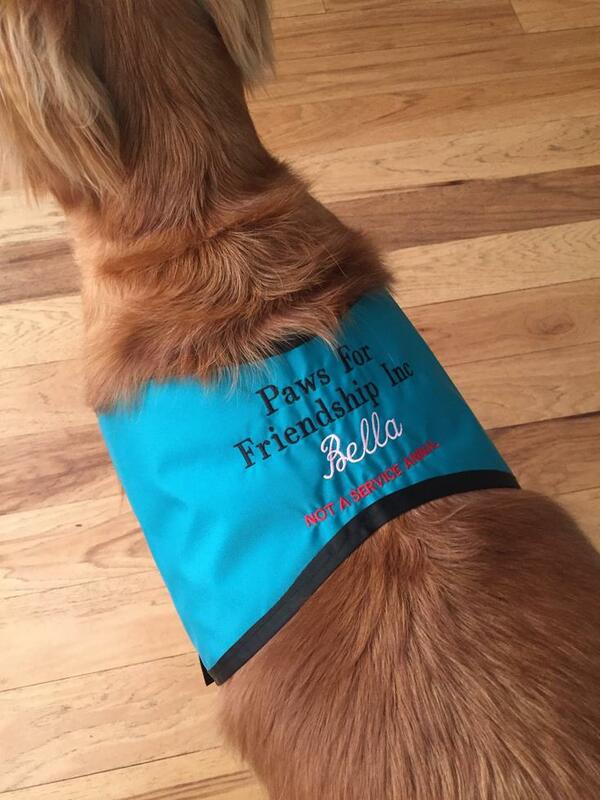 I have recently been certified as a Therapy Dog through www.PawsForFriendship.org (PFF). 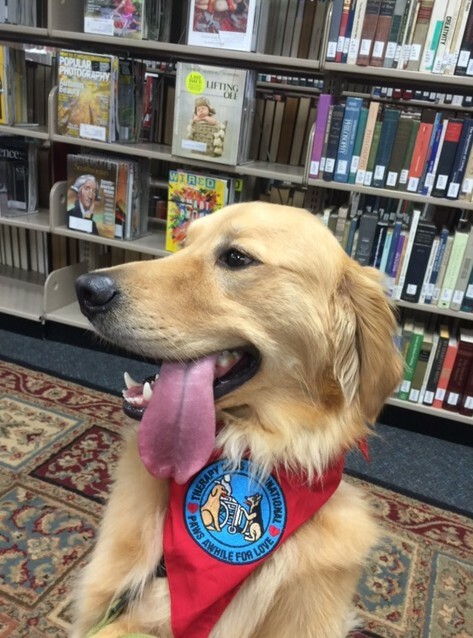 I hope to start the first Paws to Read program in the Bay County school system, an extremely successful literacy program already in schools around the state and the country. My family wants to create an active chapter of PFF in the Panhandle. I need my fellow rescues help as I cannot do this alone. 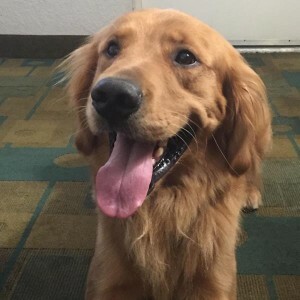 As Therapy Dogs, we provide comfort and affection to people of all ages, at schools , care facilities, hospitals, universities, any one in need of a puppy hug to brighten someone’s day. 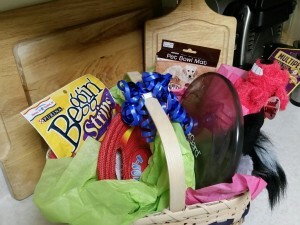 If you are well socialized and has an owner who wants to share your gift please consider joining. Certification is not hard or expensive. PFF has 386 chapters around the world and is fully insured. PFF encompasses every level of Community Outreach, please go to their website to learn more. If interested, please email doublegatorlodge@comcast.net as well as contact PFF. Please help me brighten lives from all walks of life. I can’t do it alone! Karen Rossi passed away yesterday. Known to many as “Kay”, Karen was a long time board member, a devoted volunteer, and for many of us a very dear friend. 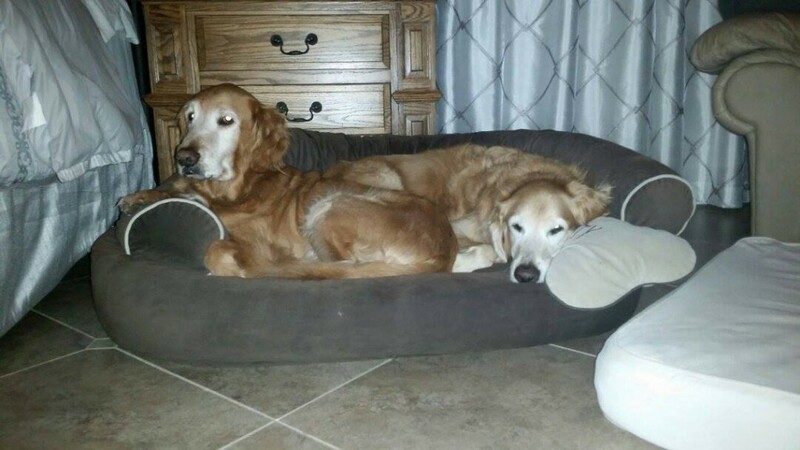 Her tireless efforts saved the life of many a golden. There are no words that can adequately describe her contributions to ECGRR or the large empty space her passing leaves for so many of us. 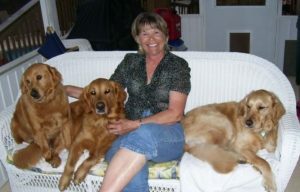 Despite the sadness, we are filled with wonderful memories of how she brightened so many lives – human and four-footed. Please join us in keeping her family in your thoughts and prayers. Here is our New Year’s card (I chose to not do a Christmas one so we could announce our new family member!) … feel free to share on the rescue website. We are so thankful for Winston. He is doing wonderful. Winston had a great day yesterday (first day of normal life, Bryant at school and me at work) and he did wonderful. He had all his toys waiting at the door when Bryant got home, ready to play. Thank you so much for this gift! He is very loved. ECGRR: What a great new year for Bryant! … the attached [is a] picture of our “Captain”, who we adopted through your wonderful organization in the spring. I knew the boy had it in him!!!! By now I am sure you heard through the grape vine that he passed Canine Good Citizen training as well as Therapy Dog International evaluations, and is our “newest” Therapy Dog Extraordinaire. This was from his first official visit yesterday at Thomas University in Thomasville, where he played with, hugged and comforted several college students in the midst of their final exams. He was quite a hit, and had a ball to boot. 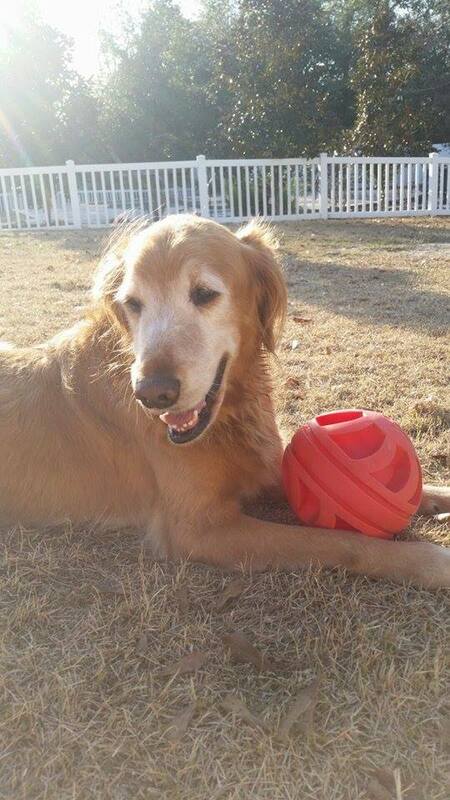 He is happy, well loved, well cared for, and a beloved addition to a family now. Thanks for giving him a sixth chance. 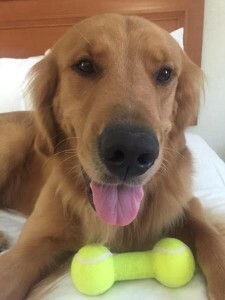 ECGRR: our thanks to you for giving this wonderful guy a loving home!! ECGRR: Thank you Darren for giving Tsali a new life in a loving home!! 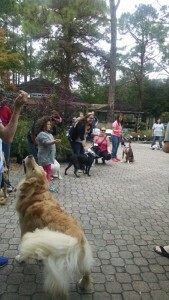 Our ECGRR folks had a great time at the Tallahassee Nursery participating in the Dog of the Day event on October 3rd . 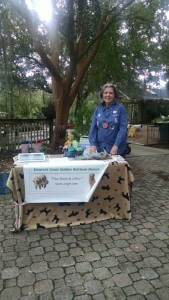 The event featured dog rescues, dog supply stores and just about anything to do with dogs. 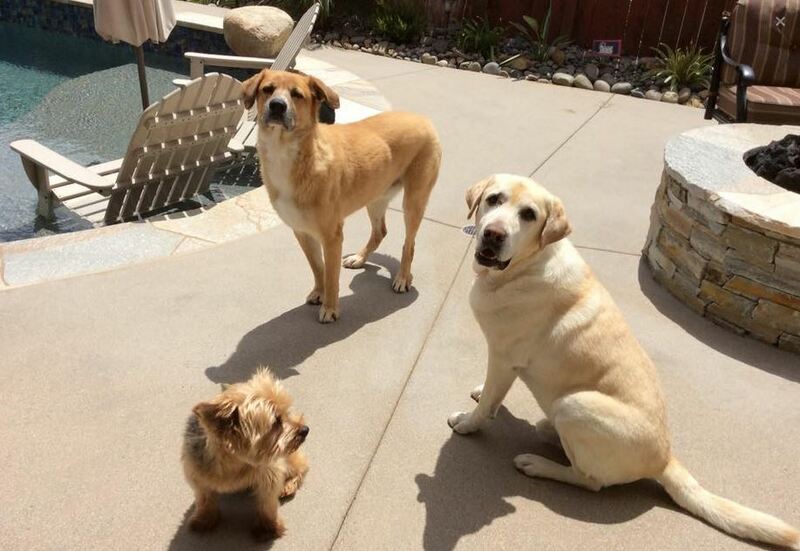 Other activities included live music and doggie contests – like peanut butter eating. 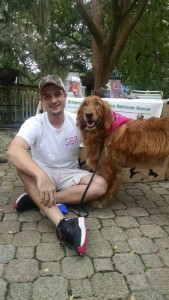 ECGRR foster dog Libbey was on hand with foster dad Mike. A big thanks to Candace and Kerri for representing ECGRR at the event! Thanks for checking in! Apollo is amazing! He is so sweet and good. He is adjusting well and has been the perfect dog. We are very attached to him and thankful to have him. He loves the ocean and swims like a fish…will send pics of this next time we are out. Here are a few recent pics. ECGRR: Looks like one happy puppy!